Designed by musicians for musicians, the Blue Equalizers Pack is a collection of 6 plug-ins processors designed to improve the quality of digital sound recordings. 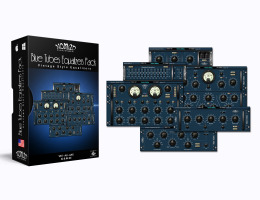 This bundle recreates the warm sound qualities of classic equalizer analog hardware. The sound quality of Blue Equalizers pack is nothing short of amazing. Yet all 6 plug-ins provide a simple and functional vintage-style interface, as well as low CPU consumption for lightening-fast processing. The BT Equalizer BX2S is a two band Baxandall tone controls, which is simple but very effective. The BT Equalizer BX2 Baxandall tone-control shelving equalizer provides low shelf (Bass) boost and cut, as well as high shelf (Treble) boost and cut. The BT Equalizer GEQ12 has been created to fit all appplications for the professional engineer. The large number of available EQ bands make the GEQ12 an ideal companion to parametric EQ, it is ideal for recording and mixing, where a professional result is required. The GEQ12 is the perfect tool for sculpting the fine detail out of raw digital audio. 12 EQ bands, adjustable Q and brick-wall Limiter circuit at the output. The BT Equalizer PEQ2B recreates the sound of the classic 60's EQ. The interaction of the passive boosting and attenuating shelving eqs has been designed to bring back the life and musicality lost in the recording. The incredibly musical character of the BT Equalizer PEQ2B is the perfect choice when a truly vintage EQ sound is what your music requires. The PEQ2B is the equalizer of choice for final musical touches. The BT Equalizer PEQ5B delivers the controls and the amazing results of a true analog EQs. Based on the PEQ2B, this model provides passive boosting and attenuating shelving eqs, 3 parametric bands with center frequency, bandwidth-Q and amplitude controls. BT Equalizer PEQ5B is more open and musical than other similar equalizers of the same type by adding an exceptional tone and character to your music. Specially designed to meet the most demanding studio tracks, the BT Equalizer PEQ322 features 3 parametric bands with center frequency, bandwidth-Q and amplitude controls, high-pass and low-pass filters as well as low-shelf and high-shelf filters. The BT Equalizer PEQ322 delivers the controls and the amazing results of a true analog EQ. The PEQ322 is the perfect choice when a truly vintage EQ sound is what your music requires.